Holiday dinners on the shoulders of the worn out cook trying to keep up a cheerful face inevitably carry a shroud for disaster. This year I had everything down pat, easy stuff I could almost pull together in my sleep, but I wasn’t cooking at home. There, in my son’s spacious new culinary domain where ne’er a drop of pomegranate juice had stained the granite nor a green scrubbie had marred the stainless, I set to work. The trimming, chopping, tying had been done ahead, so all I needed to do was pop the potato gratin in a hot oven, sear the beef tenderloin, heat the port and mushroom sauce and blanch a bowl of green beans. The children scrambled on the floor with new gifts while their mother walked out for coffee; their father went upstairs to shower, and I faced the stove. I pulled the oval shallow le Creuset baker filled with bubbling garlic-laced milk and melted butter from the oven, added sliced Yukon Golds and lightly strewed-over grated Gruyère. Grasping the sides of the baker with a large towel, I moved toward the open oven door. The baker slipped on the rounded edge of the oven rack and potatoes, along with a generous spill of hot milk, splashed into the hot well of the oven window. I couldn’t find a pancake turner, a bench scraper or any flat implement beyond a small rubber spatula to bail milk from the window well. Onto the floor I threw everything the tiny spatula could carry before I began mopping with a large soapy cloth. The oven was off and the window looked good. I cleaned the bottom of the oven door, polished the window, and when I lifted the door into the closed position, one last stream of milk fell between the sealed glass panes of the oven window. A towel now hangs over the blemish, and I’m in the doghouse. I may not want to put a pan of spuds into that big Wolf oven again for a while, but a Gratin Dauphionois is still one of the best potato dishes to serve alongside a roast or almost anything else. It’s a meal in itself, delicious the next day and one of the all time favorite winter potato dishes to remember. Note: Do not use a baker smaller than one that will hold 2 quarts or 8 cups; otherwise the milk will boil over, blacken your oven and fill your kitchen with smoke. Preheat oven to 400°F. 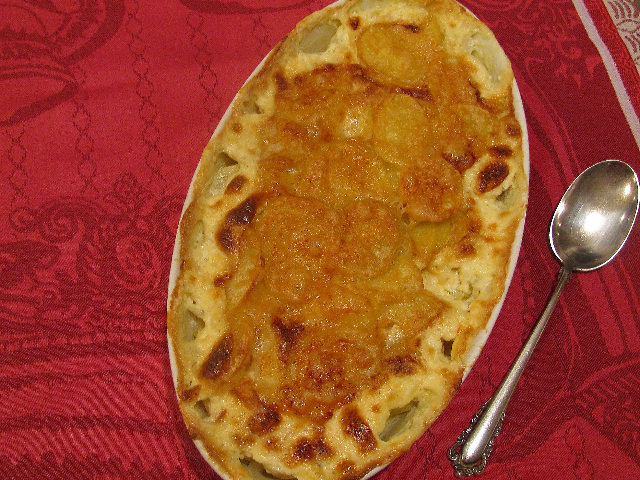 Sprinkle chopped garlic, salt and pepper in a 2-quart low oval or rectangular baking dish. Add milk, cream and sliced butter. Place in oven to heat. Peel and cut potatoes into 1/8-inch slices. (Measure a heaped quart.) This step may be done 30 minutes ahead; cover sliced potatoes with cold water. Remove hot baking dish with simmering milk from oven. Evenly strew in sliced potatoes. Sprinkle with grated cheese. Return to oven. Bake 25–40 minutes. The top should be golden brown and potatoes fork-tender. If potatoes seem dry, add 2 tablespoons water and let rest a few minutes. Serves 6. *If you choose to omit cream, increase milk to 1 1/2 cups and butter to 2 oz. or 4 tablespoons. When the Christmas cookie bake-off comes to my door, there’s no contest. My all-time favorite at home and abroad, the cookie with many different names, yet the same formula in every country is what we informally call “powdered balls.” To Greeks, they’re Kourabiathes; for Mexicans, Wedding Cakes; for Russians, Tea Cakes; for Spaniards, Polvorones. Here’s a basic butter shortbread cookie elegantly robed in confectioner’s sugar. To sample these cookies at their best, it’s wise to get on the go in early December. Pack them in a tight tin, hide them in a cool place and give them a week or two to develop flavor. The first recipe I have, still penned in primary school cursive, came from a music teacher who called them Chinese Dreams. Though there’s nothing Asian about these sweet morsels, they introduced me to a long line of siblings. I discovered the Greek version first when the St. Nicholas Orthodox Church put on a fundraising dinner in my grade school gymnasium. Years later I found the best example at a small bakery down an alley near the pier in the island town of Hydra. I can’t quite remember where I learned to add a tiny drop of anise oil to the cookies, but it’s a master trick of catalytic flavoring that works magic with any plain butter cookie. Anise oil is not anise flavoring and may be purchased from a pharmacy. A minuscule bottle will last for eons, producing enhanced butter cookie flavor. When you stick a toothpick in the bottle and lift out one drop, there’ll be no licorice overtones. For the melt-in-your-mouth Christmas cookie, bake now. Cream butter with sugar until white and fluffy. Beat in salt, anise, vanilla and brandy. Sift and stir in flour. Mix in nuts. Cover and allow dough to stand at least an hour or overnight at room temperature. This rest allows flour to absorb moisture. The dough is then ready to roll into balls. Scrape dough onto lightly floured surface. Roll into thick 6-inch log; cut the log in half lengthwise and then in lengthwise quarters. Cut each quarter in half and each half in thirds. There will be 24 even pieces. Roll each piece into a large cherry-sized ball. Place on parchment-lined or lightly greased baking sheet. Bake cookies in preheated 325°F oven for 18–20 minutes. Cookies will be pale, but they should be lightly browned on bottom. Line cookie tin or plastic box with sheet of waxed paper. Sift layer of powdered sugar over paper. When cookies are cool enough to handle, place in neat rows on top of sugar-dusted paper. Sift generous layer of powdered sugar over cookies. Layer cookies, placing a sheet of waxed paper between and covering each layer with generous dusting of powdered sugar. Store airtight. To make 8 dozen: Use 1 lb. butter, 4 oz. 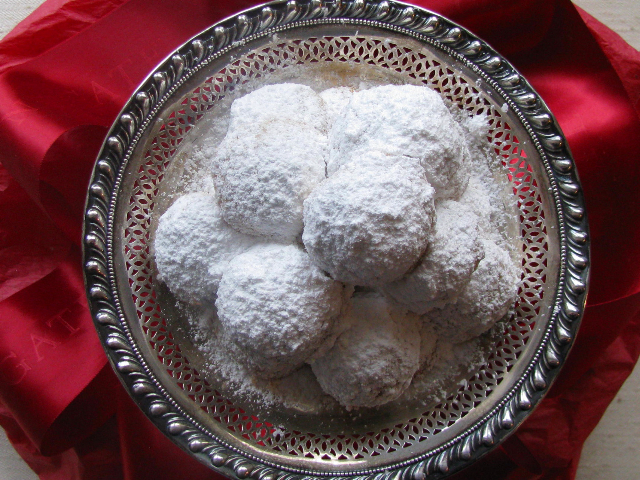 powdered sugar, 1/2 teaspoon salt, 2 drops anise oil, 2 teaspoons vanilla, 2 tablespoons brandy, 1 lb. flour, 8 oz. nuts. You are currently browsing the Mary Jo's Kitchen blog archives for December, 2011.